As an Oculofacial Surgeon, Dr. Amiya Prasad trained in eye surgery by completing his residency training in Ophthalmology. This super-specialized training in cosmetic eyelid surgery far exceeds the training in eyelid surgery of general Board-certified plastic surgeons. Oculofacial Plastic Surgeons are recognized in the medical community as the super specialists of eyelid surgery, who specialize in cosmetic eyelid surgery, eyelid reconstruction and cosmetic surgery revision procedures. It can be argued that eyelid surgery is one of the most difficult areas of cosmetic surgery. Millimeters can spell the difference between successful surgery and a surgical complication. An artistic eye, a steady hand, and extensive knowledge of this area are critical to a successful procedure. Eyelid skin is thinnest skin in the body at about half a millimeter in thickness, which makes surgery of this delicate area challenging. The eyelid support structures and fine muscles, and how they affect the anatomy of the eye area adds another set of variables which can impact your cosmetic results. Eyelid surgery is performed very close to the eye which also adds a unique risk when compared to other cosmetic procedures. 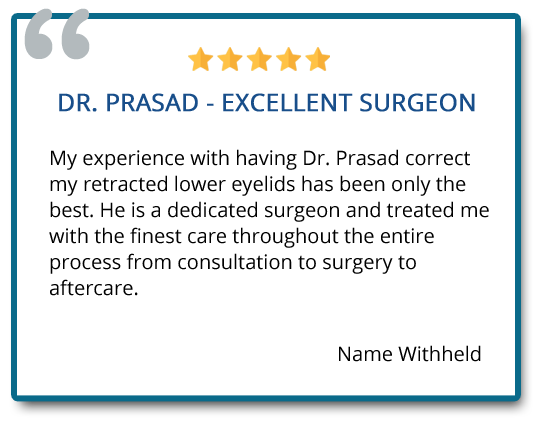 Dr. Amiya Prasad has a unique style to eyelid complication and revision surgery that gives him a unique position amongst Oculoplastic Surgeons. In addition to his training in Oculoplastic Surgery, Dr. Prasad trained in Facial Plastic Surgery as well as Body, Breast and Extremity Surgery, earning him Board Certification in Cosmetic Surgery from The American Board of Cosmetic Surgery. 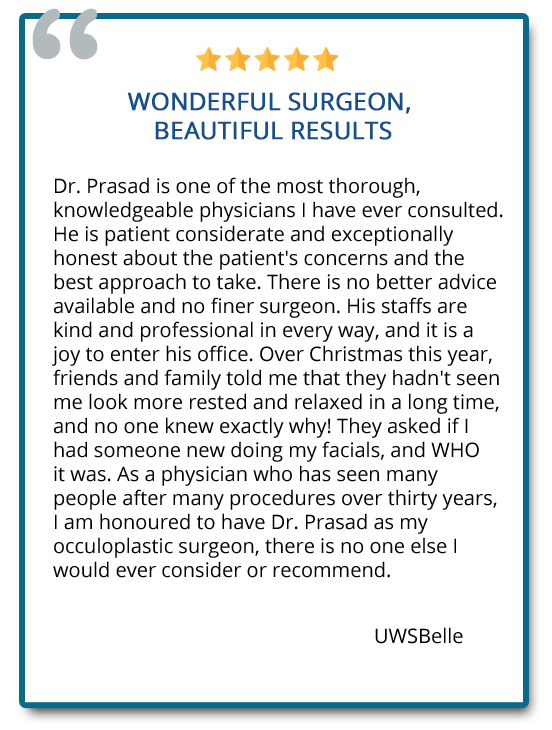 Dr. Prasad brings to Oculoplastic Surgery a certain perspective and approach by applying principles from surgical procedures which 99% of Oculoplastic Surgeons do not perform. For example, Dr. Prasad’s innovations in the use of stem cell-based regenerative technology, which he performs during facelift surgery and non-surgical hair restoration (TrichoStem® Hair Regeneration), is used routinely in his eyelid complication or revision surgery procedures to maximize the results. Eye bag removal surgery (lower blepharoplasty) is one of the most common cosmetic surgery procedures performed by a wide range of cosmetic and plastic surgeons. The lower eyelid is a complex structure which protects the lower part of the eye and plays an important role in eye lubrication. 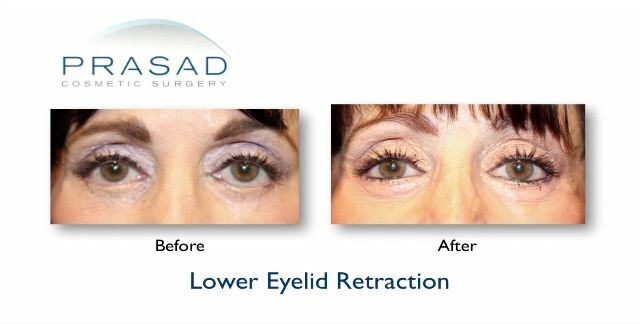 Lower eyelid retraction is more likely avoided in the hands of an eyelid specialist who understands the support structure when removing and sculpting the fat that causes eye bags, and can perform procedures to prevent this complication from happening. A common procedure to treat puffy eye bags is called transcutaneous blepharoplasty wherein an incision is made below the eyelashes to remove and sculpt the fat. This approach to lower eyelid surgery is preferred by many plastic and cosmetic surgeons who don’t specialize in eyelid surgery. As stated earlier, limited training in eyelid surgery leaves fewer options for the surgeon when performing lower eyelid surgery. Eyelid skin is also often removed with this approach, which is where problems start. Wrinkled under eye skin is often mistaken by surgeons to be excess skin, which is not necessarily the case. With successful eyelid surgery measured in millimeters, a tiny portion of eyelid skin removal can have a huge impact on the eyes. 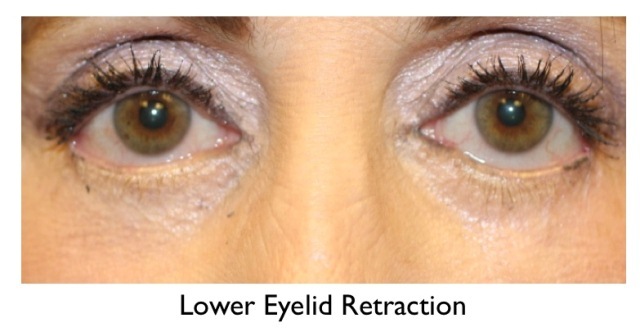 Too much skin removal can leave the eyes looking rounded and pulled down (lower eyelid retraction). Transconjunctival blepharoplasty differs from transcutaneous blepharoplasty in such a way that no skin is removed and no external incision is made. Non-specialized surgeons performing this procedure have been known to comprise the anatomical support of the lower eyelid and cause scarring which causes the eyelid to be pulled downward. The entire procedure is done from the inside of the eyelid. The transconjunctival approach is generally superior to the transcutaneous approach because it preserves the support structures of the lower eyelid, keeping them intact. 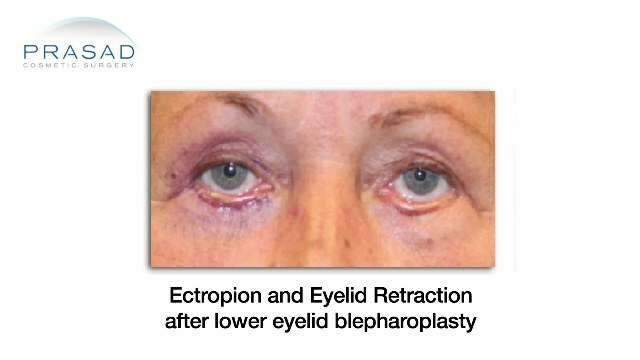 Ectropion is related to lower eyelid retraction wherein the eyelids are pulled down due to surgery, but is taken a step further when lower eyelid actually becomes exposed by turning outward. Replacing lost eyelid skin, and pulling up and anchoring delicate eyelid skin are difficult procedures. 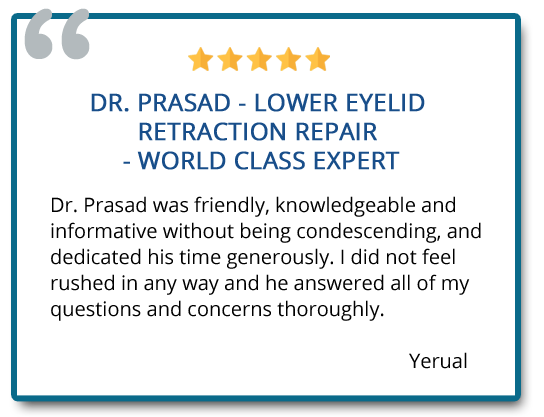 Dr. Prasad often performs grafts to build support and extra skin for the lower eyelids. 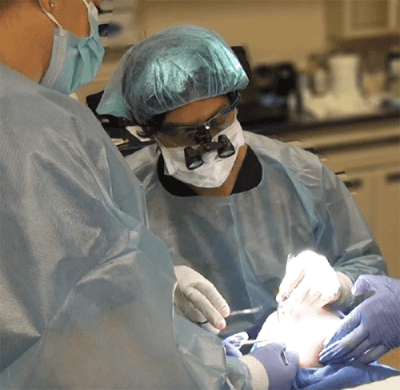 These grafts may come from materials such as Enduragen, hard palate, and skin grafts. Canthopexy – tightening and suspending the lower eyelid. Small drill holes may be needed to anchor support called a drill hole canthopexy. Lateral Tarsal Strip – a procedure wherein the lower eyelid is separated from the upper eyelid with the objective of restoring the position of the lower eyelid and reinforcing the tone of the lower eyelid. Release of Lower Eyelid Retractors – the lower eyelid retractors are released through an incision to enable a more normal eyelid position. 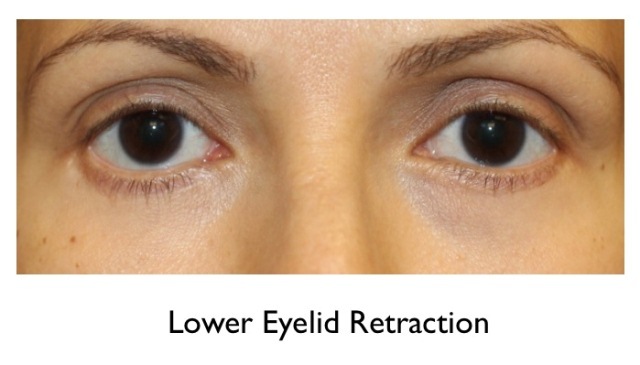 An eyelid spacer may be used to support the vertical postion of the lower eyelid. Posterior Lamellar Graft – The eyelid is composed of 3 layers. The posterior layer or lamella is the conjunctiva and lower eyelid retractors. A graft can be placed in this layer to restore eyelid position and function. Skin Graft – adding your own skin to the inside and outside of the eyelids to make up for skin lost from previous surgery. Cheek Lift – elevating the cheeks to bring up the position of the lower eyelids. Enduragen Graft – porcine acellular dermis matrix that is sterilized for human compatibility. 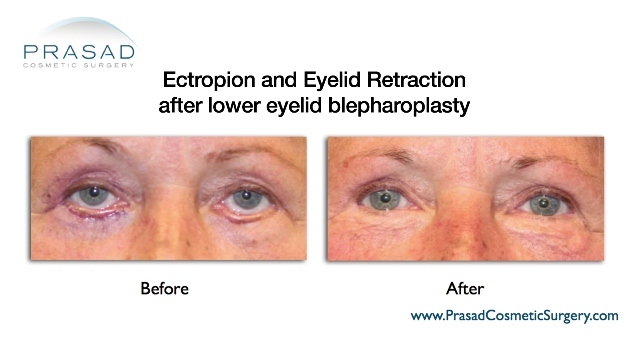 Upper eyelid retraction also occurs when too much eyelid skin is excised or removed. Upper eyelid retraction can result in a constantly surprised look, and worse, leaves the eyes unable to close fully for sleep. Upper eyelid retraction may require skin grafting, or grafts made up of temporalis fascia (taken from the scalp). Ptosis of the eyelids is often caused by a defect or stretching of the muscle that lifts the eyelids called the levator muscle. Ptosis is not only a cosmetic problem, but can impair vision, and even hinder the visual development of children who are born with the condition (congenital ptosis). Ptosis correction surgery is a specialized procedure performed by oculoplastic/oculofacial plastic surgeons like Dr. Prasad. 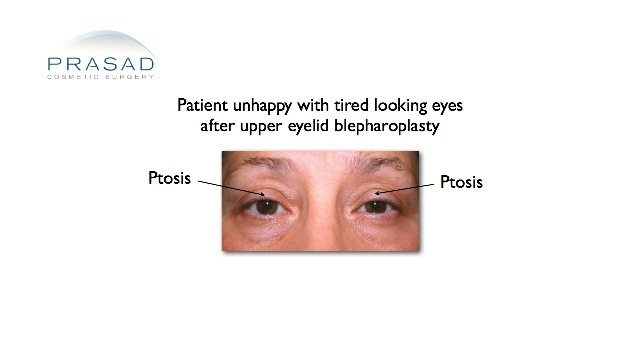 Unfortunately, many ptosis cases are misdiagnosed by general plastic and cosmetic surgeons as hooded eyelids caused by extra skin. This misdiagnosis leads to surgeons performing upper eyelid surgery (upper eyelid blepharoplasty) when they think the problem is due to excess eyelid skin and fat, so skin and fat are necessarily removed. Patients may soon find out that their eyelids are still drooping after surgery, and in some cases, find that too much skin was removed and they are no longer able to close their eyelids. Restoration of lost upper eyelid skin can be done with skin grafting, if necessary, when eyelid closure is compromised. Ptosis correction surgery involves shortening or resectioning of the levator muscle (the muscle that lifts the upper eyelid). 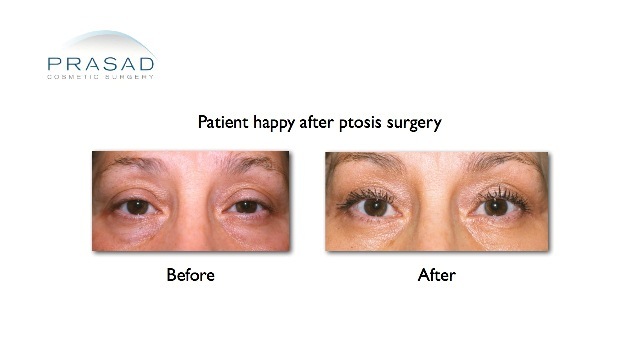 Ptosis correction surgery is an area of specialty for Oculofacial/Oculoplastic surgeons. Asian eyelid surgery, or double eyelid surgery, is a procedure where fat above the upper eyelids (sub brow area) is removed and/or reduced to allow an upper eyelid contour, and create space in upper eyelid skin for sutures to be made, as well as create a connection between the eyelid and the levator muscle (the muscle that lifts the eyelid). This enables an upper eyelid crease/fold to form. However, some surgeons may remove too much fat above the eyelids that can cause a hollowed look. Loss of fat above the upper eyelids can also occur naturally from volume loss due to aging. The area of the sub brow where fat is removed has thicker skin than eyelid. Thicker skin is more appropriate for transferring/grafting of your own body fat to fill and provide volume for this hollow space.